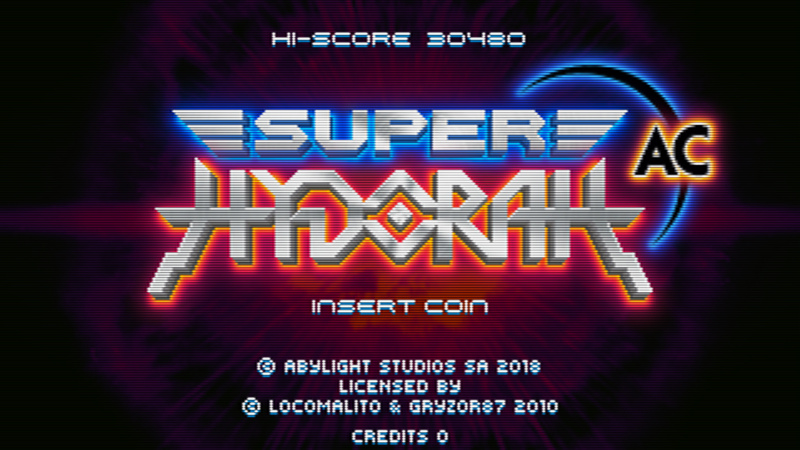 After months of work and secrecy, today we can announce the future release of Super Hydorah for the new arcade platform exA-Arcadia. Instant 2-Player mode, any player can join a game in progress at any time. Super Hydorah AC will be officially showcased for the first time in JAEPO 2018, the most important event for the Arcade Industry in Japan. This year, it’ll be held February 9th to 11th at the Makuhari Messe in Chiba. exA-Arcadia has been developed with the global market in mind and it already has in its catalogue a wide variety of titles from, not only premiere developers in Japan, but from the world over. The hardware specs will be announced in the near future. Nonetheless, it will surpass current home consoles and will support both older 4:3 CRT based cabinets as well as newer 16:9 LCD screens. Also, it will offer easily interchanged lower cost software kits and continuous support of titles via free online updates. exA-Arcadia will be able to support up to 4 software titles per unit, however Super Hydorah AC will be released as a single title and distributed first in Japan and then Europe and America. Tags: Abylight, arcade, Gryzor87, Hydorah, Locomalito, SHMUP, Super Hydorah.